Raw Banana is often used in South Indian dishes,Whole Banana plant is used in cooking,Flower,fruit,Raw Banana,Stem,Leaf,etc.. 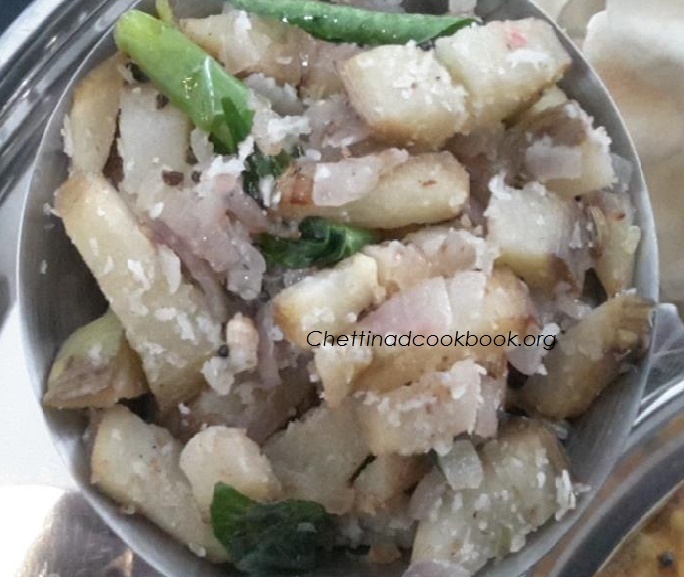 It is specially made in Auspicious days.Raw bananas are starchy vegetable and mild in taste.Since it has a flavour which is similar to potatoes, it is used in a similar method as potatoes.This podimas is very simple and easy recipe mild taste matches with Kara Kuzhambu or any Puli Kuzhambu(Gravy). It is a good source of potassium and vitamins like A and C. Potassium helps reduce risk of blood pressure and is also beneficial for our brains and kidneys. · It is high in carbohydrates and thus an energy booster. · It is also high in dietary fiber. High in fiber, including bananas in the diet can help restore normal bowel action, helping to overcome the problem without resorting to laxatives. It has a natural antacid effect in the body, so if you suffer from heartburn, try eating a banana for soothing relief. Snacking on bananas between meals helps to keep blood sugar levels up and avoid morning sickness.Bananas are high in B vitamins that help calm the nervous system. Peel and cut Raw Banana in to 1 inch thin length wise pieces,pour in water to avoid discolouration. Boil water,add Salt then add this cut vegetable cook for 3 minutes or till soft. Note:Banana gets cooked faster,so careful while cooking. Drain water,Heat pan with oil and season with above mentioned Ingredients. Add curry leaves ,chopped Onion and green chillies,saute until transparent. Now put the cooked raw banana and stir for a minute ,finally add fennel powder, grated coconut and switch off. Now Raw banana podimas is ready.